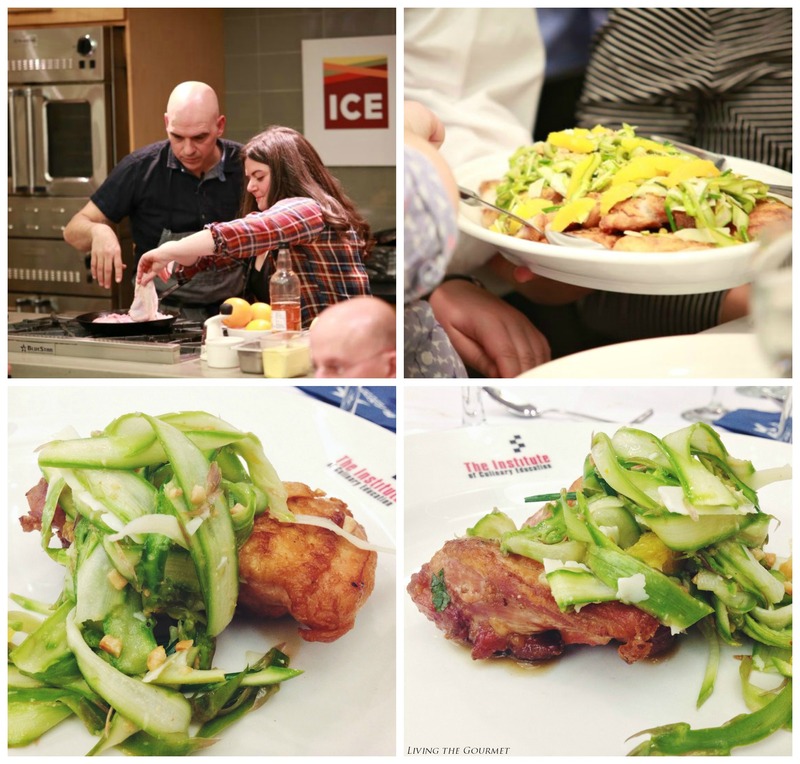 On March 19th, Living the Gourmet had the distinct pleasure of being invited to the unveiling of Chef Michael Symon’s spring menu, hosted at the Institute of Culinary Education, and sponsored by BlueStar cooking products. With a setting vaguely reminiscent of a posh modern restaurant, the night was set against an alternating backdrop of upbeat pop and reggae tunes. Photographers roamed the room, while a pair of waiters, dressed in crisp white attire, served drinks from an exquisitely set marble bar. Lines of quick chatter and reserved laughter drifted like a cloud back and forth through the room as the media in attendance mingled across overworked smartphones. Dominating gold tones, punctuated by displays of modern art, set the visual tone for the evening. If presentation is everything, the night was already a success. 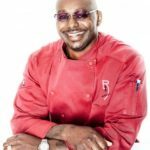 The night’s star, being a television personality, owner of eighteen restaurants, and a multiple bestselling author, it would be no surprise if Chef Symon were to present himself with an air of hard earned authority. However, from the moment I clumsily extended my hand to introduce myself across his lit stove, it was like encountering an old friend. He instantly left his set, shook my hand a second time, and offered to take pictures with the three of us from Living the Gourmet. Not only was I was impressed and put at ease, but I was now even more eager to see what the Chef had to offer. As if on cue, just as we finished taking selfies with the chef, waiters with trays hors d’oeuvres began making their rounds through the assembled media. It was Chef Symon’s first offering – Lamb Keftedes. A traditional Greek item, Chef Symon’s Lamb Keftedes greet the palette with familiar Mediterranean flavors, chiefly oil roasted garlic and onion carried on well-seasoned, perfectly cooked lamb alongside faint hints of cinnamon and cumin. The second appetizer was a zucchini fritter with feta and dill, served with a dollop of Greek yogurt. Fresh and light, the dish struck a perfect balance between the warm rustic textures of the fritter and the cool, smooth qualities of the accompanying yogurt. While never stated, I felt that this dish was meant primarily to cleanse the palette in anticipation of the main courses. After the appetizers, Chef Symon took to his set, and began the cooking demonstration. With the night sponsored by BlueStar, Chef Symon made a number of well-placed, seamlessly integrated references to the appliances on which he was cooking throughout the demonstration, and relayed how he uses a BlueStar oven in his own home. 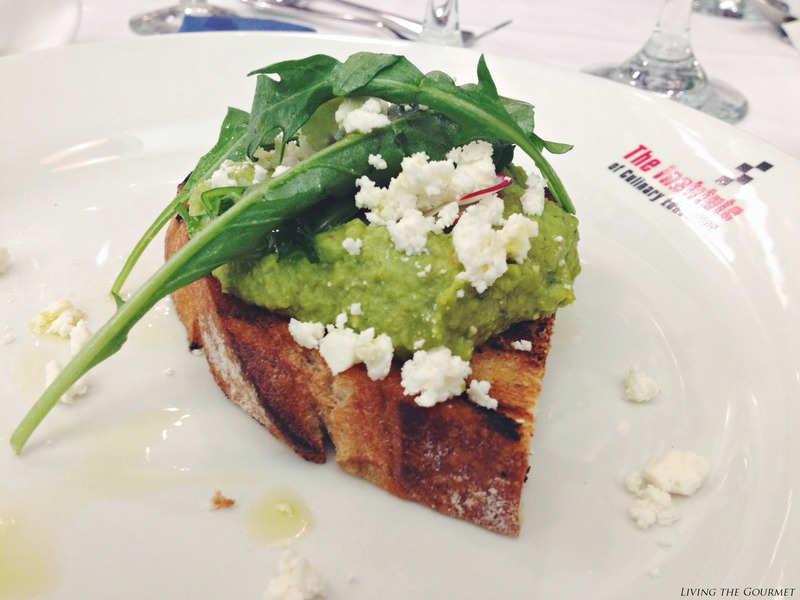 The first item served was a spring pea crostini, which I felt played into the fresh cooking theme of the Chef’s new book, 5-In-5, while also making for a simple yet satisfying beginning to the meal, as well as setting the tone for what was to come. This was followed by a cavatelli prepared with lemon, butter and sage, expertly demonstrating the Chef’s current ‘less is more’ philosophy. 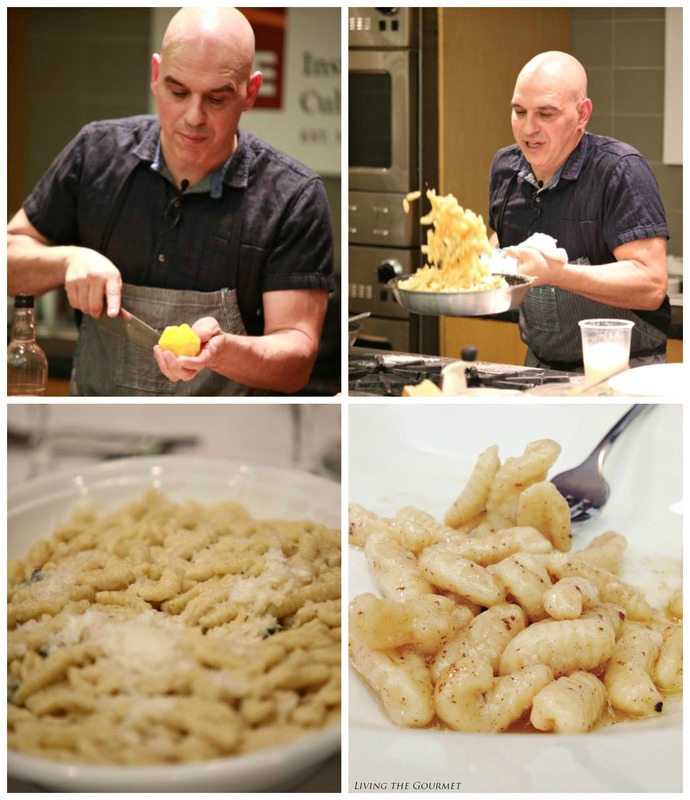 During the preparation of the cavatelli, the Chef gave a few pointers on preparing pasta. For example, he explained that one ought to liberally salt the pasta water prior to cooking, until it’s almost ‘sea water,’ as he put it. The finished cavatalli was a deceivingly simple dish of ground pepper, fresh sage, butter and lemon, making for an exceptionally smooth and well balanced pasta. 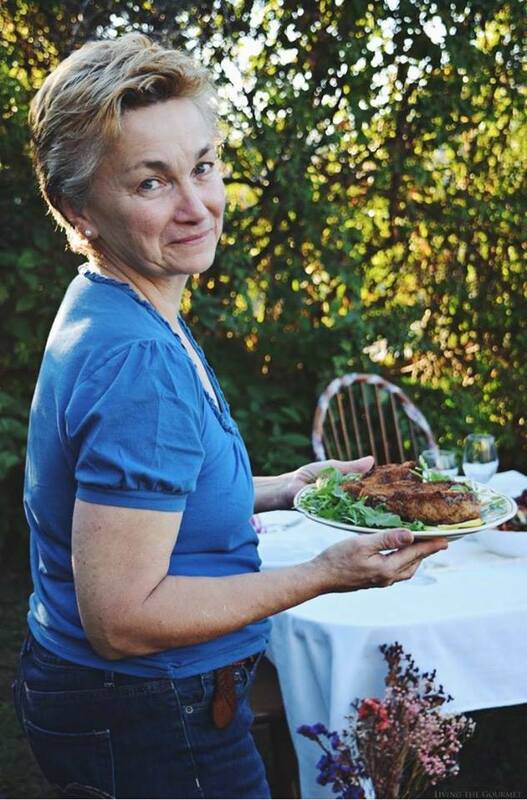 Served family style, it wasn’t difficult to imagine the dish serving equally well in a less formal venue, or even at home. The next dish, and main plate, was a half-roasted chicken served over a shaved asparagus salad. Again, measured simplicity was key to the Chef’s theme, with the chicken sautéed in oil, kosher salt and fresh pepper. The dish’s true elegance, however, rested in its bed of asparagus prepared with pecorino Romano cheese, wine vinegar, and orange zest, making for a harmonious and rustic Mediterranean blend of flavors. The meal concluded with a blackberry, blueberry, and strawberry crisp dessert, served with fresh whipped cream. Lemon zest and balsamic vinegar lent the crisp a savory flavor, while a brown sugar and cinnamon topping provided a hint of sweet contrast. When the meal and cooking demonstration had ended, I found myself thinking that with this unveiling being a sign of things to come, that we can all look forward to continued excellence from Chef Symon. With an emphasis on fresh ingredients and elegant simplicity, combined with the Chef’s infectious charisma, it was a wonderfully pleasant evening. 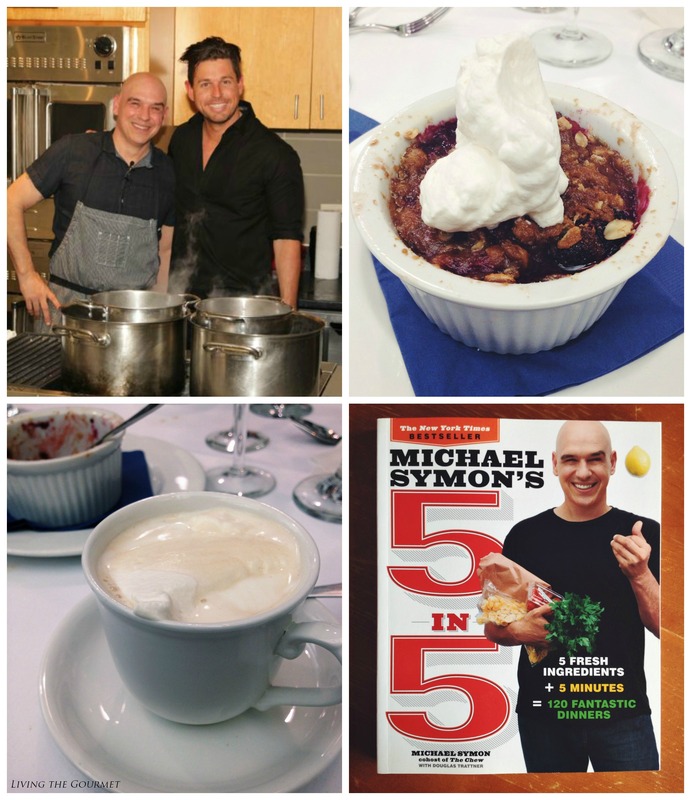 With that said, I can wholeheartedly recommend not only Chef Symon’s new book Michael Symon’s 5 in 5: 5 Fresh Ingredients + 5 Minutes = 120 Fantastic Dinners to my readers, but also any of BlueStar’s variety of top-quality cooking products. Place a piece of plastic wrap over each piece of pork and gently pound with a hammer to flatten. Place the flour in a shallow bowl and season with salt and pepper. Dredge the each piece of pork in the flour and shake off the excess. Wrap each piece of pork with a slice of prosciutto. Add the olive oil to the preheated pan. Add the wrapped pork and cook until light golden; about 2 minutes per side. 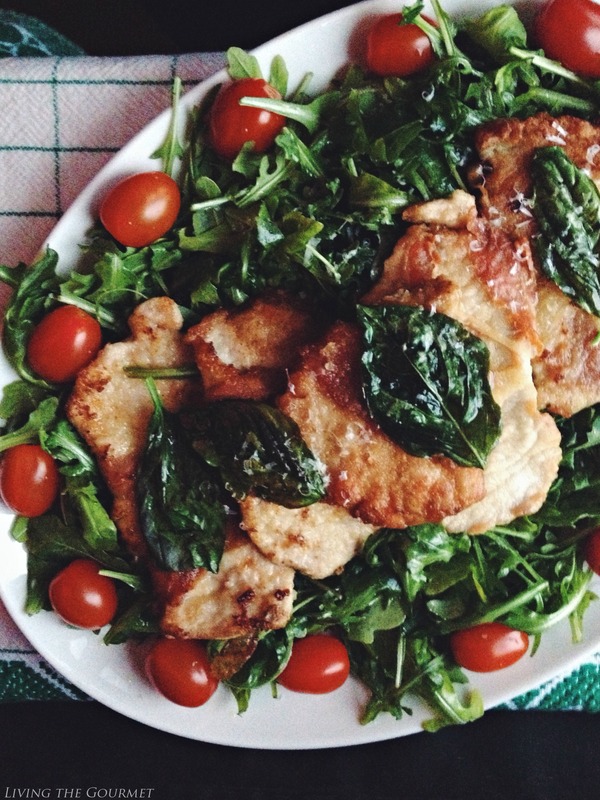 Add the basil leaved to gently crisp; remove and to serve over the pork and arugula. Combine the ingredients for the salad dressing and drizzle a little over the salad. 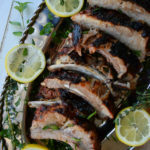 Place the warm pork over the salad, followed by the crisped basil leaves and grated Parmesan or Romano cheese. Garnish with the tomatoes and serve. Wow, what a wonderful evening, and what a wonderful account of it! You are a great writer. I am so envious, beyond envious. Chef Michael Symon is fantastic. This dish looks incredible. What a great time you had. It sounds like a great even, and everything looks so delicious. I am so glad you had this awesome opportunity Catherine. What a beautiful evening you all had!!!! 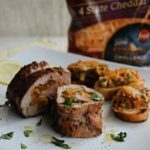 Thank you for sharing this great recipe for Pork Saltimbocca. Gorgeous dish, loved all the great pictures. I LOVE Michael Symon! He is an amazing chef. I'm so glad you enjoyed such a wonderful evening... now, that's "work" that is pure joy. 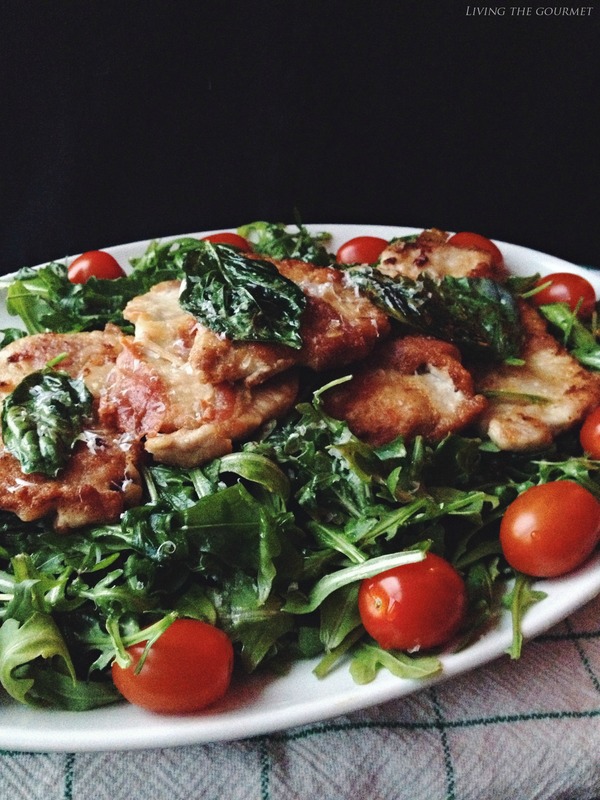 ;) The pork saltimbocca looks so good! Thank you. I'm so sorry to hear about your brother. Hope he continues to improve daily!! I've been MIA, too... doing taxes. Yuk! Hope you have a wonderful week, dear Catherine! 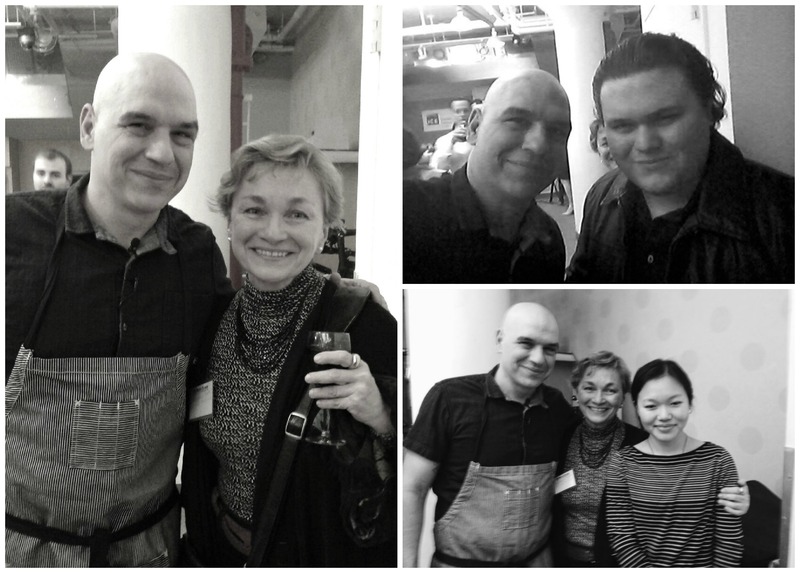 blessings ~ tanna ps LOVED the photos of you, Michael and Tammy with Michael Symon. You have a beautiful family. I love Michael Symon, too. What a wonderful evening you had!! I'm going to put his cookbook on my wish list right now! WOW! You really got my heart pumping, I am so excited!!! I really like Symon and have this book, 5in5. 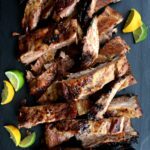 Do you watch the cooking competitions on Food Network? We are watching him now, competing with Flay, Guarnicelli, and a couple others. I also watch him on The Chew. What an awesome day, I would have LOVED to be there. And you got such a good picture with him! Oh.My! I am so jealous. What a night and experience! Oh yeah and the food looks great, too, lol. How exciting Catherine. Looks like you had an amazing evening! What a wonderful evening you had and your descriptions of each course was mouthwatering. I think I'm really going to enjoy Michael's new book, especially heading into summer. Your pork saltimbocca looks divine. What a great evening and a great recipe. It looks like you had a beautiful evening! Your pork saltimbocca looks delicious! Wow…looks as if you had a marvelous time! I love Michael Simon…he is so real and down to earth! Love him on the Chew! The Saltimbocca looks great…a must try! Nice post, Catherine! saltimbocca looks delicious Catherine,wonderful evening for you and your family, a hug ! 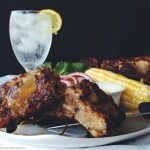 What a fun evening this would have been and awesome recipe! Pinned and shared! Wow, what an adventure. And every dish looks fantastic. 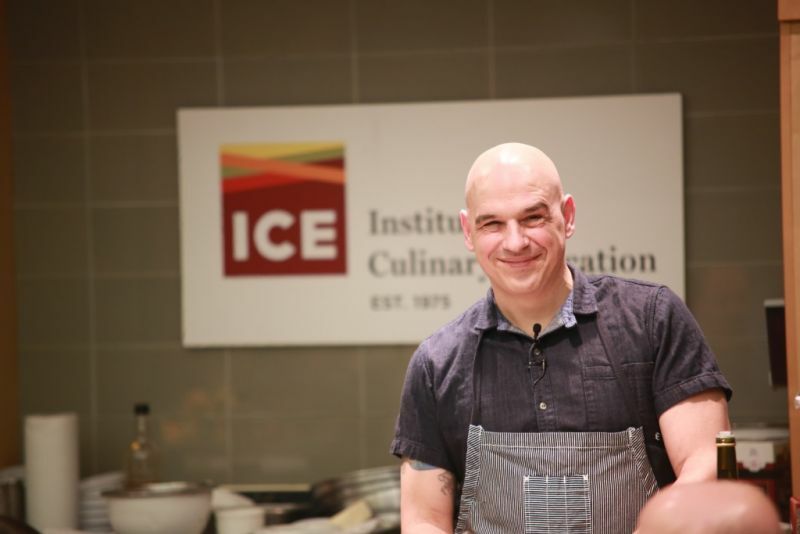 Michael Symon is one of my favorite chefs.